The development of the Crypto.com Chain also includes the creation of the Crypto.com Chain Token (CRO) — that will enable cross-asset intermediary currency settlement. 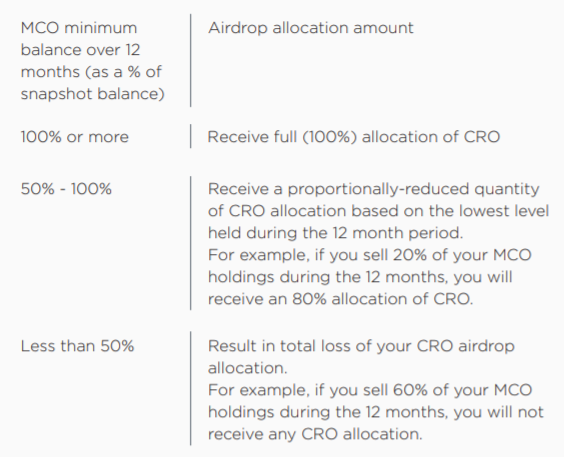 To recognise the community’s central role in our development, we’re announcing a CRO token airdrop to all eligible MCO token holders in our wallet. Airdrop allocation: Every month, 166,666,666 CRO will be awarded to Crypto.com Wallet App MCO token holders based on their MCO token ownership relative to the MCO token Total Supply. For example, for every 1000 MCO tokens held on the Crypto.com Wallet App at Airdrop snapshot date, you will be awarded 5276 CRO tokens. Airdrop distribution & transferability: Your monthly airdrop allocation will be distributed in the first week after an airdrop snapshot; and will be locked for a period of 12 months. MCO tokens held by Crypto.com will not be eligible for the CRO airdrop. All unallocated CRO airdrop tokens will be used for Community development activities.